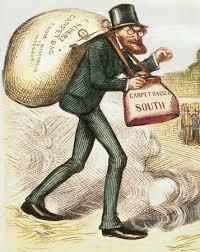 The seriousness that is emerging in the hedge fund community is their tendency to become VULTURE FUNDS who look to lend money to sovereigns at excessively high rates of return that become no different than the carpetbaggers who sought to exploit the South following the Civil War. As an investor, you should stay away from hedge funds who think they can exploit various governments rather than invest. If they do not know how to invest to expand the economy, then they have no business handling anybody’s money to ruin the reputation of the industry. They will turn investors into the hated carpetbaggers and they risk turning society into the arms of authoritarian government justified in defaulting on such funds. The hedge fund industry really began in 1985. The biggest hedge fund back then was $100 million. Unfortunately, too many hedge funds have lost their way and are becoming VULTURE FUNDS that risk the entire industry. We have to realize that 1985 was the start of the movement to create hedge funds for that was the year when everyone (myself included) returned all money to U.S. citizens and moved offshore. A normal pi cycle brings us to 2017, a year that is starting to look very bad. Hedge funds who have become VULTURE FUNDS will be defaulted upon by their clever antics of lending to governments. They falsely believe they have courts to back them up as they did in Argentina. What they fail to see is that they are playing with fire while running with scissors. Puerto Rico is yet another example of hedge funds out of control. The cash-starved island managed to persuade some of the country’s biggest hedge funds to lend them more than $3 billion to keep the government afloat. They assumed they would get a great deal since they would be earning, in effect, a 20% return. Relying on the island’s Constitution, Puerto Rico was required to pay back its debt BEFORE almost any other bills, whether it was for employee salaries or retirees’ health care benefits. They assumed the law would be on their side and they could crush the island to extract a 20% annual return. This sort of deal would have been criminal before 1980 when usury was capped below 10%; that was removed so Volcker could raise interest rates to stop an inflation he did not understand. Within just months of making this deal with the devil in the form of hedge funds, Puerto Rico ran out of money. The deal they cut with the hedge funds began to fall apart and has now set the stage for what is becoming an extraordinary political and financial fight over Puerto Rico’s future. The question arising is whether Puerto Rico should be granted bankruptcy protection in a battle with VULTURE FUNDS who have done far more damage to further the image of the hated rich by supporting a return toward Marxism. Some of the people involved are the very people who lend money to Hillary and Bush, assuming they are buying the politicians as security for their exploits. The hedge funds have banned together and hired lobbyists to try to create laws to screw Puerto Rico for their gain. This is the very method they used against Argentina and Greece to exploit high-yielding returns in billions from the hardships they impose upon the people of those countries.